There are a ton of great books releasing in January! We thought we’d give our readers a chance to win some of the titles that are creating a lot of buzz. There’s a nice mix of ARCs and pretty finished copies in this bundle for the lucky winner. Return to Me by Justina Chen – And there it was again, the troubling notion that I barely knew the people I loved. That’s the quote from the back of this book by the much-praised author of North of Beautiful, and it’s another contemporary novel that unravels complicated family ties. Falling for You by Lisa Schroeder – Abusive relationships are always tough to read, but judging from my friend Penny’s reaction, this one has some uplifting moments as well. I just started reading this, and I think fans of the author’s previous novels (and maybe Simone Elkeles) will enjoy. Teeth by Hannah Moskowitz – Remote islands. Screaming oceans. Magical gay fish. Could this story sound any more intriguing? I love the title and cover art for this book, and I think it’s about time we had a gay mermaid/merboy. This will be the first book by this author that I’ve read, and it’ll be fun to see if the author’s funny, quirky online personality translates to her books. Win this January 2013 Prize Pack! All these books retail for a total of $88, but you can win the whole lot just by entering your info in the Rafflecopter form and leaving a comment below. Open to readers aged 18 and older (or 13 and older with parental permission), one entry per household. Complete contest rules are in the entry form, please make sure you read them carefully. This contest is open to U.S. and Canadian residents only this time around, but never fear–we have international ones planned in the coming weeks, too. Good luck! Our sincere thanks to our friends at Little Brown, Simon & Schuster, and Penguin Teen for supplying the prizes for this contest. I’ve never heard of most books in this pile so it’d be nice to read a different verity from what I usually read! Oh goodness! So many good books here to add to my TBR list! Goodness! So many wonderful books here to add to my TBR list! All of the featured book look AMAZING, but I have been particularly interested in Teeth and Level 2 for a while. Thank you so much for the opportunity to win! What a great assortment of books! I’ve been looking forward to Level 2 and The Different Girl for a while. Adding these all to my TBR list now!! Level 2 and the Different Girl really caught my eye. This is a great prize pack, I would love to win! I have loved Justina Chen since North of Beautiful and I’m excited for her latest offering. All the other books sound intriguing as well, and by authors I have yet to discover. I have loved Justina Chen since North of Beautiful. I’m excited to read her latest offering. All these other books look intriguing as well, and by authors I have yet to discover. Because it’s all the 2013 reads I’m looking forward to in one awesomely enticing box xD thanks for the amazing giveaway! I have heard great things about Level 2 and all the books are on my TBR list!! Thanks for an awesome giveaway!! Ooh, VERY eclectic mix of books! I’m psyched for LEVEL 2 because I have loved each “afterlife” novel that I’ve read. The Different Girl and Level 2 are both already on my reading list and the other two sound really cool! What’s fun about many of these books is that both my pre-teen daughter and I can read them and then discuss them. Oh wow, that’s a lot of books! Thank you so much for hosting such an amazing giveaway!! I’d love to win because its been FOREVER sincr the last time I bought myself a good book! I am excited to win this prize pack because I love to read. I am planning on becoming an English teacher, and I just took a Young Adult Literature class last semester that rekindled my love for these types of books! I only recently found your blog, but I think it is amazing! These are all on my TBR list. Hooray! These are ALL on my TBR. I’m in! Some interesting books here, thanks so much for the opportunity to win! All these books have gotten great reviews and they all just look so amazing! I would be crazy not to be excited. There are so many books! But I really want to read Falling for You and Teeth. Those are the ones I want the most, but I’m interested in all of them actually. They all look and sound so good. I really want to read Falling for You and Teeth. Everyone seems to love Teeth, but I also love the cover for The Different Girl and I’ve heard some good things about Return to Me. I’m slightly on the fence about Level 2. It looks and sounds great, but I’m not a 100% sure it’s for me. 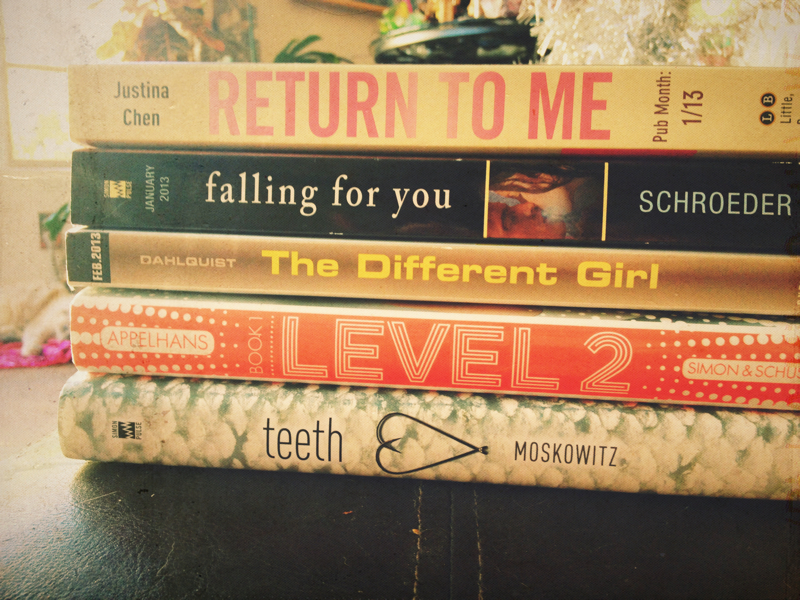 I’m really intrigued by these books, especially Falling for You and Level Two. Great giveaway! I’m excited to read Level 2. So many great reads! Thanks for the giveaway, Wendy! I’ve been looking for to January for months. So many fantastic books are being released this month (especially January 22). February 5 is also circled on my calendar. Can’t wait for Tuesday! There are a few books in there that I definitely want to get my hands on. The others I have not heard of but who doesn’t love more books to discover. I just love how diverse the prize pack is I’m so excited to get a chance to maybe win this! Thanks for the great giveaway! I love to read! Plus I have never read any of the books offered which makes it ten times better! This is such a great Prize Pack! Though I don’t have most of the books on my TBR shelf, I’m certainly going to do so now! Oh, man. I SO want to read these! Thanks so much for the giveaway! I Love books..I Love to read..Did I say that I LOVED books..I’m never without a book. I need new ones to read..Please..Great Giveaway!!! These all look amazing. I read Teeth and fell in love. Fabulous pack! I’m excited to win this prize pack because there is a Hannah Moskowitz book to win! I also have been looking forward to Level 2 because it’s by Lenore and her blog posts are always awesome. The other three books are outside of my usual taste so I’m interested in trying new genres. Umm…simply put? They sound amazing! Should there be any other reason? All of these books look awesome but I’m really excited for Return to Me because North of Beautiful is a favourite of mine. I want to win this prize pack because I’ve been loaded down with ARCs in Dec/Jan and still haven’t read ANY of these titles. Really want to read Return to Me and Teeth. Thanks for the giveaway! I’ve heard really wonderful things about Level 2, Return to Me, and Falling For You. Plus, the others look really interesting. These books are all on my TBR list and this giveaway is amazing! Heard a lot of good things about Level 2 . . . would love to read and review it & all the others! I haven’t read any of those books and they all sound awesome! I’ve been dying to get my hands on new reading material, but after shelling out crazy amounts of cash for various AP test my funds are frighteningly low…and with the knowledge that I seriously need new socks thumping in the back of my head,that new reading material taunts me from a far off horizon. Who am I kidding? these books sound promising, I’d probably go sockless and buy the books anyway. Because this is about half my super-want-2013-TBR List! Especially Falling For You, Return To Me, and Teeth – those 3 have been on my radar for awhile! Thanks for hosting this awesome giveaway! This is my first year participating in the DAC and really caring about what debuts are being published, and there’s so much promise in many of these debuts. I really want to read The Cadet of Tildor (and anything with a Tamora Pierce comparison). And Teeth sounds like a good mermaid book to get into books on that genre. I am excited to read these books. I have been wanting to read Level 2 since Lenore announced that her book had been accepted for publication on her blog. I start looking at this sight and get so distacted that I forget to comment!! I’m a fan of Justina Chen and Teeth is on my WTR list, so this would be great! Thanks for doing the giveaway! I’m a fan of Justina Chen and Teeth is on my list of WTR list so this would be super cool! Thanks for the giveaway! I’ve been excited to read many of these, especially TEETH because of it’s unique premise and LEVEL 2 because it seems like a new sci-fi dystopian blend with a different spin. what a great set! Those are some of the books I’ve been dying to read that I haven’t gotten my hand on yet. Thanks for all the giveaways you do! This is a lovely set of books up for grabs. Good luck, everyone! Ooh, I’ve been waiting and waiting for Teeth. Thanks for the chance to win! Oh what great books you have listed and I haven’t read any of them yet! But I sure do want to!!! I really want Teeth, and the others sound great too. I would love to win because they all look like REAllY great reads!!! A lot of these books sound absolutely fantastic. Really diggin’ the idea behind Level 2, especially. Thanks for running such an awesome contest! I am so excited about Level 2 and The Different Girl. I think they could be some of my favorite reads of the year (even if the year has just started). Um… JUSTINA CHEN. LOVE her stuff. Level 2 because there’s so much hype and I want to see if it’s as good as people say. Thanks for the giveaway! Awesome prize pack! I would be excited to win because Level 2 is one of my most highly anticipated titles of this month! Thanks for the chance to win! Wow, so many great books! I’m super excited for Level 2, and I read Gordon’s adult books so I’m curious about his YA debut. Because TEETH! I really need to read Moskowitz. Nearly everyone loves her. I read a really positive review for Teeth so it immediately went onto my TBR. Because TEETH! I really need to read Hannah Moskowitz. Nearly everyone loves her. And I read a really good review of Teeth so it immediately went onto my TBR. Cool giveaway! I’m starting to do this too. A prize pack every month. Thanks so much for hosting this. I love the broad selection available here! LEVEL 2 and TEETH look especially fantastic. I’ve read most of Justina Chen’s and Lisa Schroeder’s books so I’m thrilled to see their latest books being offered in this giveaway. I’ve also been looking forward to reading Level 2. Thanks for the giveaway, Wendy. I am interested in Level 2 by Lenore Appelhans. Plus, it’s free books. Who can say no? I am interested in Level 2 by Lenore Appelhans. Plus, free books. Who can say no? I would love to win! I am a high school teacher in Brooklyn,I love to read and encourage my students to read new books! This would really help out my classroom library! what a amazing contest! hope I win! Whoa, did not know Justina Chen had a new book coming out — super-excited now for Return to Me; I really enjoyed North of Beautiful! These all look awesome, thanks for the giveaway! I’m very curious about Teeth for some reason. They look awesome and I’ve been wanting to read them! Just discovered your site, and I’m excited to browse through your posts! Looks awesome! Totally want to read 3 of these. The other 2 are new to me, but look awesome as well! Thanks for the contest. All of these sound so so perfect!! These look great! I wanted to read all of these when they came out! These look great! I had planned to read all of these when they came out! Wow! What interesting picks! Would love to read all od rhese. Great picks! All of these are on my TBR wishlist!! Level 2, The Different Girl, and Teeth all sound great! Actual paper books are such a treat for me now. As much as I love my eReader, I’d love to add some wonderful titles to my bookshelf. And these look wonderful! I haven’t gotten to read most of these books, and winning them would definitely make it a little easier, haha! It sounds like a awesome mix of books!! These books sound great! I would love to read these. There is just something about holding an actual book these days! I have a kindle and love reading on it but there is just something about holding an actual book! I would love to read these! They sound great! I really want to read Level 2 and Return to Me! All of these books look so great. :) Thanks for the giveaway! Cry me a river since I don’t stay in the states/canada, but good luck to everyone else! This is amazing and very thoughtful! I would love to read these novels whether I win or not. These’ books look extremely interesting and they say not to judge a book by it’s cover but i looked up the fronts and they’re gorgeous! I love Hannah Moskowitz and the rest of the books look pretty interesting as well. Thanks for the chance to win! What an awesome giveaway! I’ve been wanting to read Falling For You, but the others sound great too- I’m a sucker for a good dystopia! I shall keep my open for the international ones. Just in case. I haven;t read any of these novels! Some interesting picks. MOst sound good, but are a little out of what I normally read, and it’s always nice to be pushed outside the box, right? Great giveaway! I really want to read Falling for You. I’ve been dying to read these! I need to get back into the habbit of devouring books, and a haul is the perfect thing to do that. I’ve been hearing great things about LEVEL 2 and look forward to reading it! I’m also interested in THE DIFFERENT GIRL. Ever since I read the summaries for all of those books, I’ve been wanting to get my hands on them, especially Teeth by Hannah Moskowitz! I’m not sure it’s letting me leave a comment. I’m excited because these all look fantastic and I love YA! I’m excited to win because I love YA and these all look great. I’ve been looking forward to Level 2 since I saw the Goodreads giveaway. I loved reading North of Beautiful so much that I’m excited for Return to Me. They all have lovely cover and sound interesting. I have really been looking forward to reading Falling For You, Return To Me, and Level 2. Teeth and The Different Girl sound really good too. Thank you so much for the giveaway. I could use some good YA in my life, plus level 2 sounds super intriguing! 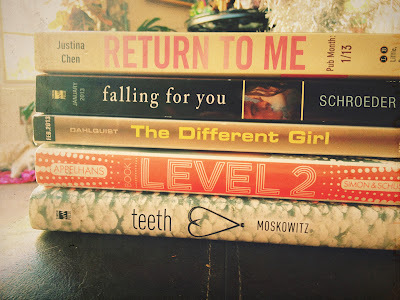 Level 2 is one of my most anticipated reads of 2013! I would love to have real books, as opposed to the ebooks I have been reading lately. I love YA books, they keep me in touch with the students in the schools I visit. I would love to win some actual books! I have been reading too many ebooks and miss the feel of real, new book. Why? I love books! I love getting free books! I love winning things! I love your blog! Most excited for? Hmm.. The whole prize pack is amazing but my most anticipated and the one that I think I’ll enjoy the most is Falling for You by Lisa Shroeder. I’m interested in quite a few of the books in this prize pack. Thank you so much. There are so many reasons to be excited for this one! Debut authors like Lenore, books I’ve heard great things about, and The Different Girl, which I almost begged the publisher for but to no avail! I’d love to win because I’ve been wanting to read all of the books in the prize pack! Thanks for holding the giveaway! First of all, you ROCK Wendy, for doing this giveaway! I can’t even begin to express how awesome you are, especially now that we’re all finding out how much we actually spend on book blogging. Why am I excited about this giveaway? Because every book in this prize pack is one I want to own! Please pick me! I’m not above begging. ha. I’ve been in a bit of a reading slump. Need to find that spark again and some of these titles sound promising! I’ve been in a bit of a reading slump. Nothing I’ve read lately has really wowed me. Looking for my spark again. Some of these titles sound promising! So excited for reading in 2013!! Holy hell, TEETH!! I want this so bad! Thanks for the opportunity to win books that I may not have actively sought out. It’s an interesting mix. omg i want ALL THE BOOKS! thank you for hosting this! I can’t wait to read Level 2!!! Thanks for the giveaway! I’m soooo excited to read Level 2! Thank you for the giveaway! I’m excited because it has ‘Level 2’! I’ve been waiting for the book since I first found out about it last year. And these books look awesome. I really need to write some positive reviews instead of negative ones. I’m really excited about Teeth and Level, and am curious about Return to Me and The Different Girl. I already own a copy of Falling For You, and loved it. ;) So if I happen to be lucky enough to win this prize pack, I’d be more than happy to share that part of the prize with someone else, like another one of your entrants. Thank you so much for doing this awesome contest! i love the mix of titles. i am dying to read return to me. Thanks for the giveaway. And also because of the fact I really want to read these books, I know we all do, but these would really get me out of the reading funk I am in and also Falling For You, I’ve heard nothing but greatness about it. Nothing but greatness. Level 2 sounds great, and any book described with magical gay fish has to be read! Level 2 sounds interesting, and any book described with magical gay fish has to be read! I love how you all chose books that aren’t a part of the “OMG I NEED THIS” book titles that have been circling around the social media sites. These titles are unconventional and I love it. I’m most excited because you all chose books that most likely need the proper attention for the awesome that they contain. I love how these are slightly unconventional books for January. They aren’t the “OMG I NEED THESE!” book titles that have been circulating around the social media networks. To me, I’m most excited because these are books that most likely need the attention they deserve for the possibility of awesome that they contain. Though I have LEVEL 2, the others I don’t, and I would a go at having them as they’re all interesting premises! I would love to win for many reasons. Alll the books sound awesome! I love reading! The books are on my tbr pile and did I mention I love reading, especially ya? Thanks for this awesome giveaway!!!!!! Two of the books are on my TBR list and the other ones look really interesting. I’ve been wanting to read level two and a different girl since I first read their summaries~ Thank you! All of these books sound great. A couple of them are on my to-read list, and I’m adding the others. Well, the ones that I didn’t know anything about look fantastic!! And I’ve heard wonderful things about the repeat authors. Such a well rounded prize pack!! I put in the wrong tweet link. SO bloody sorry. Why do I want to win this? Because all of these books are on my wish list and look AWESOME! Seriously, I *need* these :) Thank you! Sounds like an interesting mix with a lot of new authors I’d like to try.